How High is the Ceiling for Mike Trout? Outfielder Mike Trout of the Los Angeles Angels was voted MVP of the all-star game yesterday after leading the American League to a 6-3 victory with a home run and two runs scored. It was the second consecutive season Trout earned MVP honors of the midsummer classic which makes him the first player ever to record such a feat. Trout led off the game with a homerun to opposite field becoming the first player since Joe Morgan in 1977, and only the fourth of all-time, to homer to start the game. In his four consecutive all-star games appearances, Trout has now hit for an all-star game cycle as he has, in order, singled, doubled, tripled, and now homered. All of these hits have come with Trout as the leadoff batter for the American League. At the age of 23, Trout is already the game’s best player. Yes, there are many stars such as Bryce Harper of the Washington Nationals, Andrew McCutcheon of the Pittsburgh Pirates, Giancarlo Stanton of the Miami Marlins, and Miguel Cabrera of the Detroit Tigers, but none have the accolades Trout has received in less than four full seasons in the major leagues. Besides his four all-star appearances and two all-star game MVP awards, Trout won the 2014 AL MVP award and was voted AL Rookie of the Year despite not coming up from the minors until April 28. He led the league in stolen bases his rookie season and runs batted in during last season’s MVP campaign. 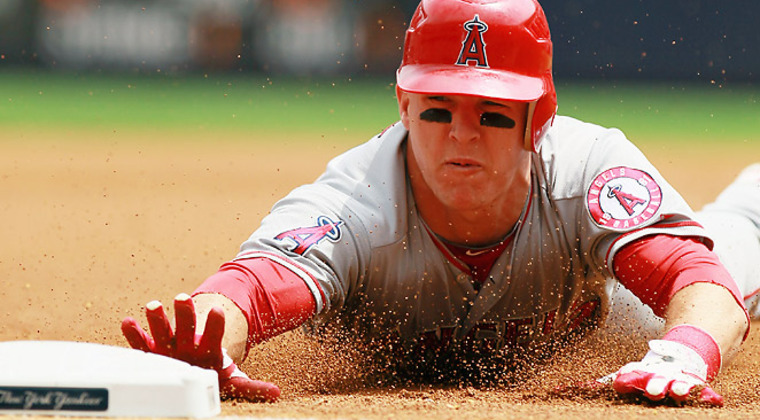 Trout is a player who has the rare blend of power and speed. His rookie stat line of 30 home runs, 45 stolen bases and 125 runs scored in one season was the first time those numbers were put up by a major leaguer. While Trout’s stolen bases have gone down since he entered the majors in 2012, he set new career highs in 2014 with 111 rbis and 36 home runs while leading the majors with 115 runs scored. Trout draws comparisons to former New York Yankees’ great Mickey Mantle for his hitting and fielding ability. Not a bad comparison for a player who has not yet hit his prime years. Many people are already calling Trout a can’t-miss future Hall of Famer if he keeps putting up the stats he has in his short career. He already has 124 home runs, 361 rbis, 111 stolen bases, and a .306 career batting average. Trout is a team player who reminds me of a kid who just enjoys going out and playing the game. He always seems to be smiling and goes out and gives it his all on a daily basis. Will Trout ever challenge for the all-time home run record whether you consider it to be Hank Aaron’s 755 or Barry Bonds’ 762? That would require many years of over 40 home runs which Trout has never done at the major league level. Whether or not Trout ever comes close does not matter. His overall game and demeanor will put up consistent stats for at least the next ten years as he wins at least two more MVP awards.